6/1/2015.........Crystal Blue Dry Cleaners is now an official drop off site accepting Dress for Success Atlanta clothing donations. Crystal Blue Dry Cleaners is proud to become an official drop off site accepting Dress for Success Atlanta clothing donations. The mission of Dress for Success Atlanta is to promote the economic independence of disadvantaged women by providing professional attire, a network of support and the career development tools to help women thrive in work and in life. Visit their website for full details. 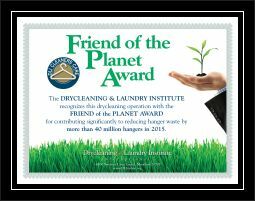 Crystal Blue Dry Cleaners is proud to receive the Friend of the Planet Award from the Drycleaning & Laundry Institute. Click below to view the Press Release or Award Certificate. You spoke, we listened! Our Platinum Shirt Service for men’s dress shirts is now only $1.35 Our prices may have fallen, but our quality remains high. With our unique Platinum Shirt Service, you’ll enjoy whiter whites, bolder colors and a soft, comfortable feel. Our gentle process and unique multi-enzyme cleaning formula actually extends the life of your shirts. We now Pickup & Deliver throughout the area. This new service is offered to our customers at no extra charge. Click here to sign up or to get more information. Crystal Blue Dry Cleaners is now a proud member of the South Eastern Fabricare Association. Click here for more information. Crystal Blue Dry Cleaners is now a proud member of the Drycleaning & Laundry Institute. Click here for more information. 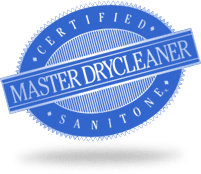 We are proud to announce Crystal Blue Dry Cleaners is now a Sanitone Certified Master Drycleaner. 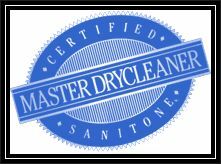 Each Sanitone Certified Master Drycleaner is part of a select group committed to rigid standards of excellence and a full range of services. Wherever you see this seal you can expect the finest in garment care along with the other professional skills you need to keep your wardrobe looking its best! Crystal Blue Dry Cleaners commits to purchasing supplies that are made in USA. Click here for a full list of Made in USA items we use. We now have lower pricing on many dry cleaning items including suits, blouses, jackets and sweaters.